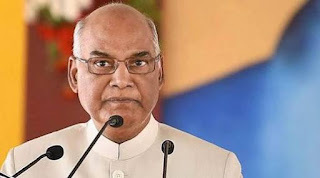 The President of India, Ram Nath Kovind, will visit Telangana, Tamil Nadu and Kerala from August 4 to 7, 2018. The President will land in Telangana on the evening of August 4, 2018. On August 5, 2018, the President will grace and address the 7th convocation of IIT Hyderabad. On the same day, the President will visit Tamil Nadu to meet Dr M Karunanidhi in the Kauvery Hospital, Chennai. On August 6, 2018, the President will inaugurate the ‘Festival of Democracy’ in Thiruvananthapuram to mark the conclusion of the diamond jubilee celebrations of the Kerala Legislative Assembly. On August 7, 2018, the President will inaugurate the centenary celebrations of St. Thomas’ College, Thrissur, before returning to Delhi.